Composer found music even in the frigid waters of the Arctic Sea. Over 80 albums and 32 years, revered Japanese cultural icon Ryuichi Sakamoto — who made a rare Toronto concert appearance Sunday at the Queen Elizabeth Centre — has dabbled in a lot of genres. Since he graduated from his electronic music studies at Tokyo’s University of Art, Sakamoto, 58, has entranced us with the lighthearted techno glitch pop of Yellow Magic Orchestra; fused Asian and Western contemporary pop with such albums as Neo Geo and Illustrated Musical Encyclopedia; wrote sweeping award-winning scores for cinematic treasures The Last Emperor, The Sheltering Sky and High Heels; explored dance and the remix world with Sweet Revenge and Anger; spun out some children’s music in Peachboy, and delved into classical with Discord. His choice of collaborators has been equally inspired: new wave trailblazing Davids Byrne and Sylvian, punk deity Iggy Pop, the eclectic and resourceful Thomas Dolby, funk bass legend Bootsy Collins; surf pop innovator Brian Wilson and our own legendary Robbie Robertson. The latest creative partnership venture from this jack — actually, master — of all trades? A stoic one: an Arctic Sea glacier. In 2008, Sakamoto and 40 other artists, musicians, writer, photographers, oceanographers, architects and scientists all sailed to the Arctic near Greenland as part of Cape Farewell’s Disko Bay Expedition to observe the effect of climate change due to global warming. “I’ve been concerned about environmental issues since the ‘90s,” said Sakamoto, who makes his first Toronto concert appearance in over a decade with a solo appearance. Sakamoto didn’t come unprepared: he brought a hydrophone, which is an underwater microphone, and recorded streams of H20 pouring and trickling off the glacier. “I was in kind of a cold mode when I started recording out of noise,” Sakamoto explains from his home in New York. “I wanted to express some quietness, coldness, stillness — and the sound of ice and water streaming over a glacier — most of those sounds were very cold to me. Currently working on duet albums with German electro avante-gardist Alva Noto and Austrian experimental guitarist Christian Fennesz, Sakamoto was appointed an Officer of the Order of Arts and Letter, France’s highest cultural honour, in 2009 in recognition of his wide body of work. However, Sakamoto isn’t sure what privileges accompany that particular accolade. “I heard that with that badge, I can get into a three-star French restaurant without waiting in queue,” he chuckles. 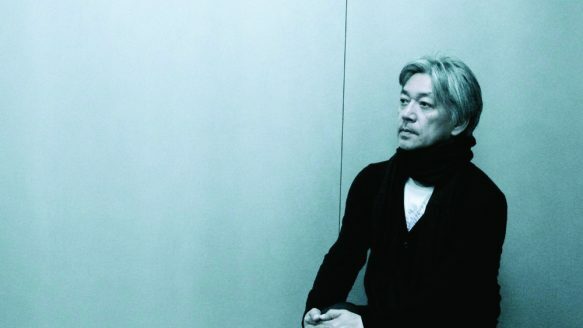 Be the first to comment on "Ryuichi Sakamoto works with giants and with glaciers"